Cover me upto the age of 80 years. Thank you for showing interest. You are just one step away in getting your quote. Help us know you better and get your quote right away! *For a healthy, 25 year old male non-smoker for a policy term of 25 years, exclusive of taxes. 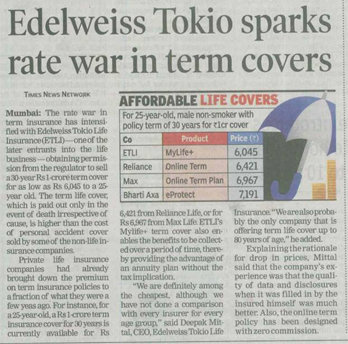 Disclaimer: Edelweiss Tokio Life – MyLife+ is only the name of the non-participating non-linked term assurance plan and does not in any way indicate the quality of the contract, its future prospects, or returns.Please know the associated risks and the applicable charges from us. Tax benefits are subject to changes in the tax laws. For more details on risk factors, terms and conditions, please read sales brochure carefully before concluding a sale. 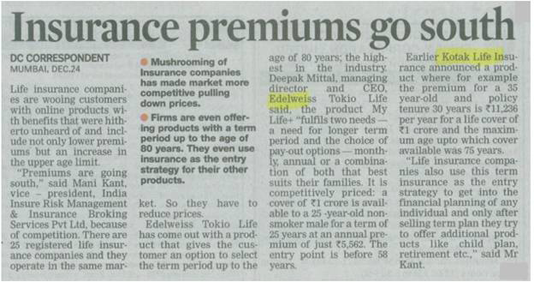 Edelweiss Tokio Life Insurance Company Limited | IRDAI Regn. No. : 147 | CIN: U66010MH2009PLC197336 | Registered Office : Edelweiss House, Off CST Road, Kalina, Mumbai, Maharashtra 400098 | Corporate Office Address: 3rd& 4th Floor, Tower 3, Wing ‘B’, Kohinoor City, Kirol Road, Kurla (W),Mumbai – 400070| Toll Free. No. : 1800-212-1212 | Fax No. : (022) 7100 4133 www.edelweisstokio.in | UIN: 147N027V01 | Flower & Edelweiss are trademarks of Edelweiss Financial Services Limited; Tokio is Trademark of Tokio Marine Holdings Inc. and used by Edelweiss Tokio Life Insurance Co. Ltd. under license. – IRDAI or its officials do not involve in activities like sale of any kind of insurance or financial products nor invest premiums. 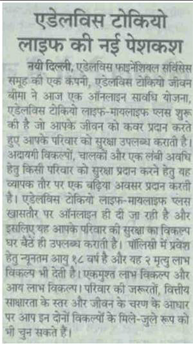 – Public receiving such phone calls are requested to lodge a police complaint along with details of phone call, number. By submitting my contact details I authorize Edelweiss Tokio Life Insurance to Call or SMS me with reference to this enquiry. This overrides the DND registration. Thank You for filling up the details. Our callers will get back to you.